When I first started to paint in oils, many years age, I would place about twelve colours on the palette and very quickly into the painting process, the entire working area would be covered in a multitude of colour mixes. There was a tendency to use up all the paint simply because it was there. Most of the mixes were the result of almost random additions of bits and pieces of a variety of paints. Chaos on the palette would be a good way to describe the working method. My biggest problem was trying to remember which paints made which colour mixes, and sometimes I accidentally arrived at a nice mix. More often than not, I couldn’t reproduce this nice mix as I had forgotten the combinations of paints I had used. My solution was to use a reduced palette and in time I got to know a few colours very well. The funny thing about this is that the resultant paintings were no less colourful with five colours than the paintings with twelve. Actually they were more vibrant and there was also a harmony of colour which was not there, when a large number of colours were used. I’m not sure if this is an easier way for beginners to produce an acceptable painting. It may require a lot of practise to get it to work, and some types of subjects, like flower paintings, might necessitate a range of colours. After all, my subject range is narrow, and although I might think each of my paintings are different from the others, realistically they are quite similar. Anyway, have a look at the video below and see what you think. 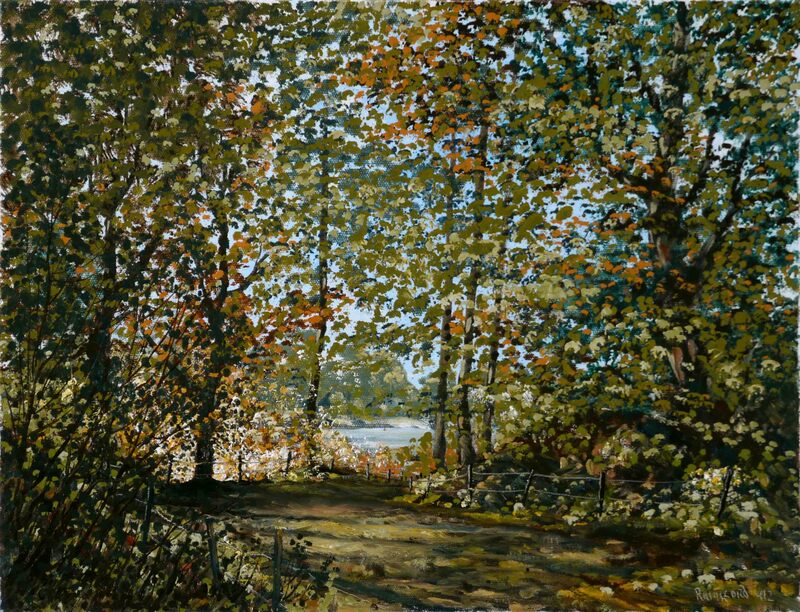 This entry was posted in Oil Painting and tagged Art, autumn, Culture, Education, fall, Inspiration, Irish landscape, Medium, Oil Painting, Oil Painting Instruction, Oil Painting Landscape, painting, Pictures, simple, Solvent, Time lapse painting, Trees. Bookmark the permalink. I think we are all different. The problem is finding what you are good at, and then trying to get better with practice. Regarding natural colour sensitivity, its all relative. I would have the same thoughts as yourself when I admire the really colourful or interesting works of other painters. The humbling thought that I have a lot more work to do and the discontent with my own work drives me on. Maybe discontent is good if its acted-on positively. Dear Liam: Ha, ha, ha… me too. I was thinking that I will never learn because I was using twelve or more colors and suddenly I discovered you with this wonderfull collors and such a generous person. May God Bless you and your family. I live in Brazil, almost 70 years old, with a special daugther (Turner Syndrom), who take´s me a lot of work. My grandmother by father´s side, was half English, half Irish, of Cork. Dominic James Coackley, an architect of Cork, was her father. I was a private pilot, when I was Young, but painting is my real love, I need to paint. Excuse my terrible english and I thank you for this marvelous gift you provide us. Thank you Iwonka for your lovely comment. There are Irish people in every part of the world. Coackley is a popular name in Ireland. I’m delighted you found the post helpful in your painting. This has been really helpful, Liam. Watching the evolvement of the paint colors as well as the painting has been an added bonus. Thank you so much. I hope you continue to do this. Thank you Ann. Only lately I realised how helpful the ‘behind the scenes’ stuff is to many people. I’m fascinated by the working methods of other artists but there is very little online other than purely instructional working methods. I intend to continue to show ‘warts and all’ of the construction process.